While the location reporting of the FiLIP is not real time, the parent can decide how often they would like the map to refresh. You can set to “Daytime Only” so it only refreshes during 7am – 7pm, or you can have it refreshing 24 hours a day. Regardless of which option you choose, you can set the map refresh automatically at intervals of 15, 30, 45 or 60 minutes. In addition, you can request an immediate update at anytime by pressing the refresh arrow at the bottom left hand corner of the location screen. Or, use Turbo Mode if you need to receive more frequent updates for a short period of time. 1. Automatic Updates: Slide this on (to the right) if you want your FiLIP’s location to automatically refresh. Then, select the time intervals you like between each refresh. Note: The shorter the refresh intervals, the quicker the battery will drain. 2. Automatic Updates (Continued): If your Automatic Updates is turned off, your FiLIP’s location will NOT be automatically updated. 3. Daytime Only: Slide this on (to the right) if you want your FiLIP’s location to automatically refresh between 7am and 7pm. If you want your FiLIP’s location to automatically refresh 24 hours a day, then slide this to the off position. Note: If this setting is turned to the off position (to the left), there will be a greater battery drain. 4. Turbo Mode: Slide this on (to the right) if you want your FiLIP’s location to update every 3 minutes for a 15 minute period. After 15 minutes, Turbo Mode will automatically turn off and your regular settings will be restored. Note: Using Turbo Mode often will drain the battery more quickly. 5. 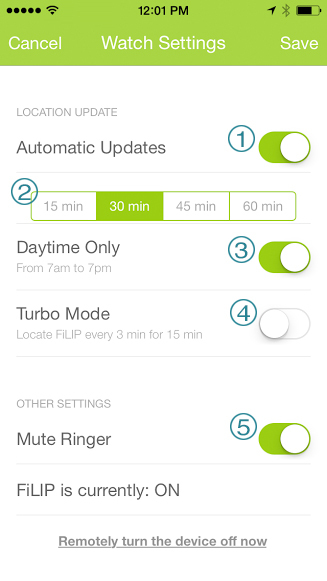 Mute Ringer: Slide this on (to the right) if you want to remotely silence the ringer on your FiLIP. To turn the ringer back on, slide this off (to the left).